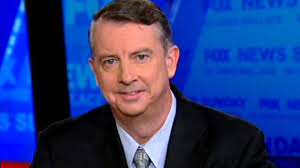 Hat/Tip: Jim Geraghty and his Morning Jolt Newsletter with this article from NRO: "Ed Gillespie's Clever Play in the Virginia Gubernatorial". One of the men I admire the most in politics, a really nice guy, Ed Gillespie, R-VA, has done it again with a brilliant move that could help pull out a victory in the Virginia governor race. Why do I say, do it again? Because in 2014, with Ed Gillespie a huge underdog and way behind in the polls for the VA Senate race against Democrat Mark Warner, he made a brilliant ad that almost pulled out an amazing upset in the last few weeks of the campaign. The Tales predicted that it would close the gap and could be a winner in the following post published on October 29, 2014. "There is one senate race that the Republicans are not really counting on to take over the senate, but one that I have been hoping, as much as any other, the Republicans will win. That is the senate race in VA with GOP nominee Ed Gillespie taking on the incumbent Democrat Mark Warner. I really like Ed and think he will make a great senator and be a great spokesman for the GOP. I have contributed to his campaign and really hope he can pull out, what at one time thought impossible absent a GOP wave of biblical proportions. At one time Ed Gillespie was as much as 20 points behind the incumbent, but with a great positive campaign by Ed, he has pulled to within single digits and is closing fast. That is why, when I saw this campaign ad, that is only 30 seconds long, just released by the GOP, I got excited as I really believe this will be the ad that could turn this senate race around and close the deal for Ed Gillespie. You may say that this ad doesn't deal with the big issues and is rather trivial, but then you are missing the real point of the ad that I think will resonate with VA voters. This ad, while announcing it is about the Washington Redskins name, brilliantly points out that it is the unpopular Harry Reid who is calling for the name change. And even though Mark Warner won't announce how he would come down on the issue isn't important. The ad, without saying so specifically, reminds the voters that Mark Warner will vote to put Harry Reid back as the majority leader, the same Harry Reid worried about the name of the Washington NFL team and at the same time refuses to bring up legislation that is really important to the people of VA. That's why I think, what at first glance seems like a rather simple ad, is actually a brilliant ad that is a winner [for Ed Gillspie, that is]!" This ad came so close to winning in the Senate race, and now I believe, Ed Gillespie has made the tweet [that I hope he turns into and ad] that could just very well turn this race for Governor in his favor in 2016. 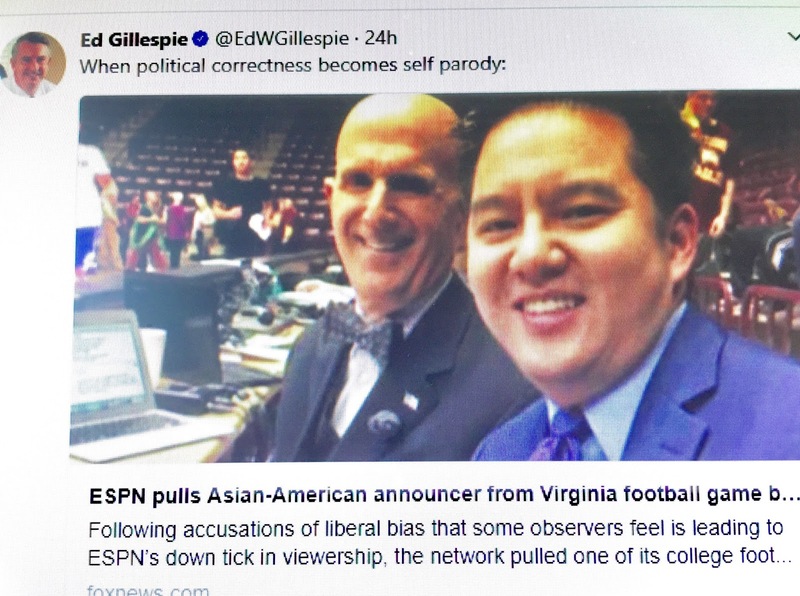 "Yesterday Ed Gillespie tweeted that ESPN’s decision to reassign Robert Lee from a University of Virginia football game represented “When political correctness becomes self parody.” At this point, Gillespie doesn’t have a good way to tie his Democratic opponent, Ralph Northum, to the idiocy of the network’s decision. But the theme is the same: incoherent political correctness has invaded the world of sports, and Gillespie is as tired of it as you are, Virginia." I pray and hope Ed Gillespie's "clever" tweet in 2016 will be effective as his brilliant ad [IMHO] was in 2014. But this time let it push Ed over the top for victory! Thanks once again Jim Geraghty for your great Morning Jolt newsletter and your article on "Ed Gillespie's Clever Play".